Time for me to sign off. Good night. "I felt before the game that it was more than doable. We took the initiative, we kept knocking on the door. "Obviously, losing the goal makes it a real difficult task. "There's no shame in going out the tie but there is a feeling that we have improved over the last wee while. "There's a lot of pride as well as disappointment." Aberdeen return to domestic action with a Scottish Premiership meeting with Kilmarnock at Pittodrie on Sunday. "Aberdeen were nowhere near their best and can have no complaints about going on. They just didn't create enough." Jonny Motion: "#bbcscotfootball we were robbed by a poor refereeing display, again. Uefa need to look in to ref's standards"
So, disappointment for the Dons as they bow out of European football for the season. Another Dons corner comes to nothing and the referee sounds his whistle. 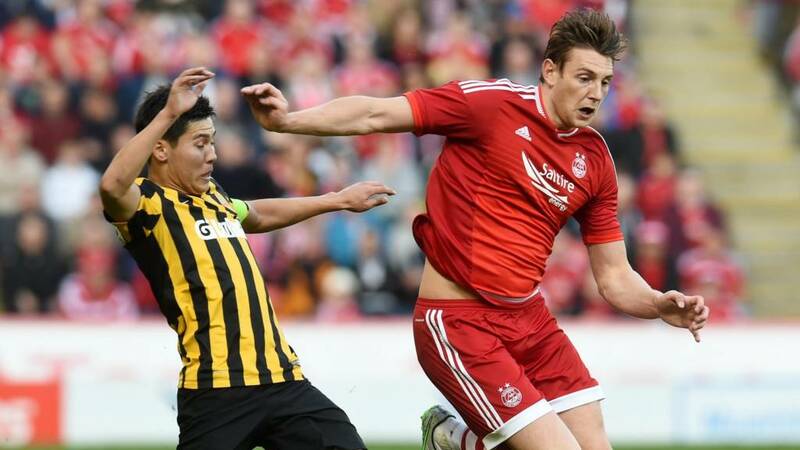 Kairat progress to the play-off round and Aberdeen are out of the Europa League. Paul Quinn's header is tipped over by Vladimir Plotnikov. Heartbreaking for the Dons. Islambek Kuat replaces Stanislav Lunin in Kairat's latest change. Five minutes of stoppage time are announced, prompting a loud cheer from the home fans as they seek to encourage their team. Aberdeen win a corner and a Kairat player goes down in the box clutching his leg in pain. The Dons players surround the referee and their opponents protesting at what they see as time wasting. Niall McGinn drives into the side netting for Aberdeen. He may have been better going for the far post after cutting in from the left. Four minutes of stoppage time left. If Aberdeen get another goal without conceding, this tie will go into extra-time. Hope for the Dons as Niall McGinn sends a free-kick deep to the back post where Kenny McLean stoops to head past Vladimir Plotnikov. Serginho, with one of his first touch, rattles the Aberdeen crossbar. That could have completely ended this tie. Serginho replaces his fellow Brazilian Isael for Kairat. It looks as though Ash Taylor will move into attack for Aberdeen in the closing stages. Willo Flood and Paul Quinn are introduced for Aberdeen with David Goodwillie and Jonny Hayes coming off. Ten minutes plus stoppage time to play. A couple of Aberdeen corners lift the home crowd but Jonny Hayes' deliveries do not cause the Kairat defence too many problems. Kairat scorer Gerard Gohou has made way with Dorde Despotovic coming on. Twenty minutes to go and Kairat goalkeeper Vladimir Plotnikov is back on his feet. The match resumes. Shay Logan gets a shot on target for Aberdeen and Vladimir Plotnikov positions himself well to smother the ball. The keeper then pulls up in pain but it's not immediately clear why. Adam Rooney replaces Peter Pawlett in Aberdeen's first change. Frustration for the home fans as Shay Logan's cross misses everyone. It's been that kind of night for the Dons. Peter Pawlett's snapshot from 25 yards is well wide of the Kairat goal. Striker Adam Rooney is preparing to come on for Aberdeen. That cancels out Aberdeen's away goal from the first leg and Aberdeen now need to score three goals to progress. Gerard Gohou scores on the rebound after Danny Ward blocks Mikhail Bakaev's shot. A crushing blow for Aberdeen. Another effort from McGinn, this time from outside the box, is well over. Decent chance for Niall McGinn. The Aberdeen forward retrieves Shay Logan's deep cross in the inside left channel and snatches at his shot somewhat, sending it wide. Andy Considine gets a warm cheer from the home fans after making a well timed challenge on Isael. This could be a tense second half. Space in the final third is becoming ever more scarce for both sides. The second half begins with Kairat kicking off. Denis Maxwell:"#bbcscotfootball Just a goal required by Dandies...come on." Jonny Motion: "#bbcscotfootball aberdeen could and should be ahead at half time. The dons are all guns blazing! COYR!!" "It's been end-to-end at times, with lots of good play from penalty box to penalty box then it breaks down. "Shay Logan looks a bit nervous and anxious, which is unusual and Niall McGinn has been anonymous, which is disappointing since the Kairat left-back is there for the taking." Kairat still lead 2-1 on aggregate after 45 minutes at Pittodrie. The Kazakh side started the better of the two sides but Aberdeen gradually got a foothold and, with a bit more composure in the final third, could have got themselves ahead. A third booking for Kairat, this time Mikhail Bakaev is carded for a challenge on Peter Pawlett. Mikhail Bakaev thunders in a shot for Kairat but Aberdeen goalkeeper Danny Ward has it covered. Aberdeen continue to come forward with purpose but their final ball lets them down. Kairat appear content to soak up the pressure and look for counter attacks. TK - Celtic fan: "C'mon the Dons! Let's get another Scots team in Europe." Mark McManus: "Cmon Dons, do Scotland proud! From a celtic fan!" Kenny McLean, Aberdeen's scorer in Kazakhstan last week, hurries himself into a shot around 22 yards out and skews if well wide. A bit more composure needed there. Jonny Hayes drags a shot narrowly wide after space opens up in front of the Dons winger. Tynecastle1874: "all the best to @AberdeenFC tonight fae a Jambo :D #bbcscotfootball"
Kairat have been guilty of some scrappy fouls and both Zarko Markovic and Anatoliy Tymoshchuk have picked up bookings for the visitors in the last few minutes. Jonny Hayes fires in a shot for Aberdeen but Kairat goalkeeper Vladimir Plotnikov is equal to is. Peter Pawlett and Ermek Kuantayev go shoulder to shoulder in the Kairat box and the Dons winger goes to ground. There's a loud appeal from the stands but Czech referee Miroslav Zelinka is unmoved. Aberdeen win a free-kick and Niall McGinn's effort goes straight into the wall. The Dons are getting plenty of set piece opportunities but need to do more with them. Aberdeen win a corner that is eventually cleared by Kairat. The Kazakh side break and Stanislav Lunin is sent in on goal with only Danny Ward to beat but his low shot is blocked by the goalkeeper. "Al the ingredients are there. It's how you would want it, it's how you envisage European nights here. We've got it all to do. "We feel if we can get a real strong Aberdeen performance, with strong individual performances, we can get the job down. "The more positive we are in the final third of the pitch, the more likely it is we'll be rewarded. "We want to make this night a special night." No sooner has the game started that Gerard Gohou tests with Aberdeen goalkeeper Danny Ward with a low shot. The players are making their way on to the pitch and there's a loud roar from the passionate home crowd. 1-0 win at Dundee United on Sunday. Kenny McLean added to his goal in Almaty with a remarkable header, which he did confess was a bit of a fluke. Can the midfielder make it three from three? longest distance travelled in a European club competition. Aberdeen pulled out all the stops for a luxury airliner. I wonder if tonight's visitors travelled in such fine style? Aberdeen got this far after squeezing past Shkendija of Macedonia on away goals, then they turned over highly-rated Croatian side HNK Rijeka 5-2 on aggregate. Tonight's winners will have one more round to play before the Europa League groups are decided. And skipper Ryan Jack echoed his manager's thoughts, by adding: "The first goal in any game is vital. Obviously we are going to look to get the first goal. First and foremost though we need to keep it tight and make sure we don't give away anything sloppy. "This is exactly what I want as a player. I want to be playing in the top competitions. For us, the Europa League is just that right now. That is part of why I wanted to stay at this club. I'm looking forward to the match and hopefully we will get the result." A 1-0 win will do it for Aberdeen, so the hosts might not exactly come flying out of the traps. Speaking yesterday, manager Derek McInnes said: "You don't have to score in the early stages of the game. Ideally we will. There has to be a measured approach and intelligence as well passion." Captain Ryan Jack returns to the starting line-up, along with Niall McGinn, Peter Pawlett and David Goodwillie after the quartet were on the bench for Sunday's win at Dundee United. Kairat top-scorer Gerard Gohou is back after missing the first leg through injury. Aberdeen: Ward, Logan, Taylor, Considine, Shinnie, Pawlett, Jack, McLean, Hayes, McGinn, Goodwillie. Subs: Brown, Flood, Rooney, Smith, Robson, Quinn, Shankland. Kairat Almaty: Plotnikov, Markovic, Bruno, Gorman, Kuantayev, Isael, Bakaev, Tymoschuk, Islamkhan, Lunin, Gohou. Subs: Tkachuk, Rudosselskiy, Darabayev, Kuat, Serginho, Konysbayev, Despotovic. Referee: Miroslav Zelinka (Czech Republic). The Dons looked to be in a spot of bother at 2-0 down after 22 minutes in Kazakhstan. However, they steadied the ship after a rocky opening and Kenny McLean's second-half strike has given them a real shot at reaching the play-off round. Good evening and welcome to our Europa League qualifying coverage as Aberdeen take on Kairat Almaty at Pittodrie. A near full-house will be behind Derek McInnes's men as they look to overturn a 2-1 deficit.